. Published on May 11, 2018 . I didn’t flee, though. I hit the send button, and went out with my roommate for drinks and greasy bar food to celebrate it. When I tell people about it, I brag that I didn’t even throw up sending it. I just hyperventilated a little. In my defense, it’s been a very long build up. After I calmed myself, I did some reflecting on how I got there. (I know that sounds cheesy, and rather expository, but it’s honestly true.) Obviously, the thesis didn’t start the moment I handed it in. It’s really real! So official and capitalized! The semester, I worked in Thesis Advising from Prof. Lisa Fishman. We met four times to talk about my manuscript. Lisa and I worked closely together; she helped me to achieve the vision that I had for the work. She helped me see what I had written in a more complex way, to push my poetics, and to fully understand what it was I was writing. She also provided some much needed assurance, reminding me that I can and did write well, and that the work I was writing was indeed worthy of being written at all. But the manuscript didn’t start there. 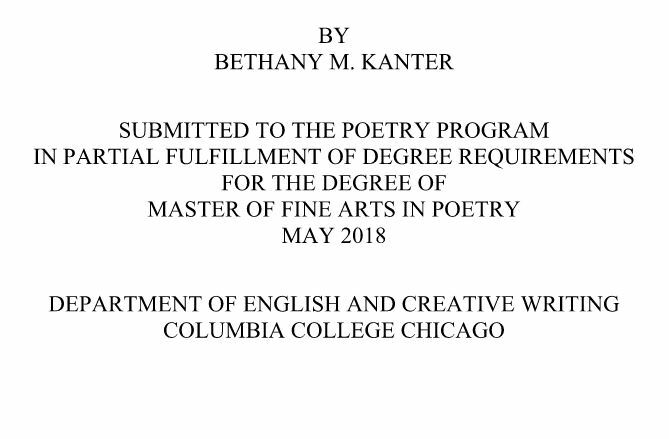 Last September, I began a class called Thesis Development. The goal of the course is to help students put together a full-length manuscript that will be edited and turned in the semester following. I had done a good chunk of the writing over the summer. I had some very fresh, barely edited material that took up maybe half of the 40-60 pages that are required. The class helped me to navigate writing a work that is admittedly very difficult for a reader to read. (This is a problem. Obviously, it should be readable? That’s kind of the goal.) We talked about the order, about the section breaks, about the way to make an arc out of a long work. Even if you can’t see it the way you can in a novel, there is a plot in a book of poetry; there’s a kind of rising action and falling action that helps the reader through, and to engage with the poems in the best possible way. But the manuscript didn’t start in Thesis Development. By now, you’re probably thinking that the conceit of this post is getting a little old. Joan Didion said in her essay, Goodbye to All That, “It is easy to see the beginnings of things, and harder to see the ends.” The problem here is that I can’t see either. I can’t see where it began. The work has a lot to do with being severely ill in 2015, but it’s also working with ways that I was writing things and thinking about things maybe from the first time I read. I sent a copy of my manuscript to my mentor from my undergrad. Among the helpful criticism and notes, he said, “It’s a privilege to see how you have kept at it and now the multitudes of things you wanted in your writing have cohered into a single thing. 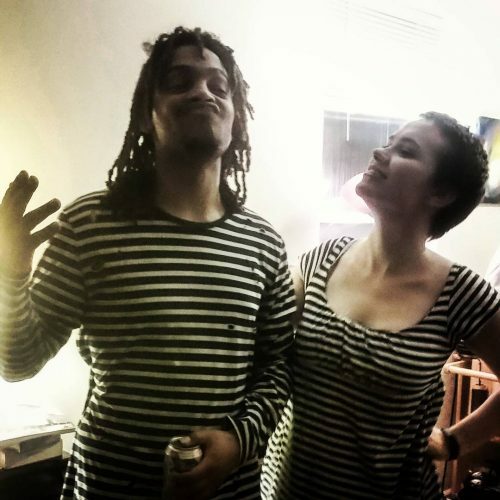 That moment when the two worlds aren’t two worlds any more.” I was flattered, of course, but I felt just as privileged to have the person who got me to love writing poetry to see what it had done. This post is a little longer than usual, but the truth is, I’m trying to find a way to explain how I felt after hitting that send button. I felt exhausted. I felt anxious. I felt overjoyed. If there’s a reductive moral here, it’s that things accumulate, whether they accumulate into poetry, or something else. 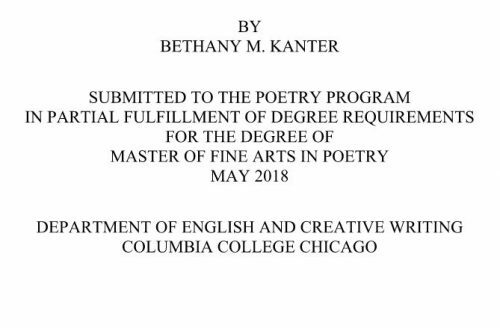 I feel incredibly fortunate that these things have accumulated through my experience at Columbia, with my classmates, my professors, and with poetry. 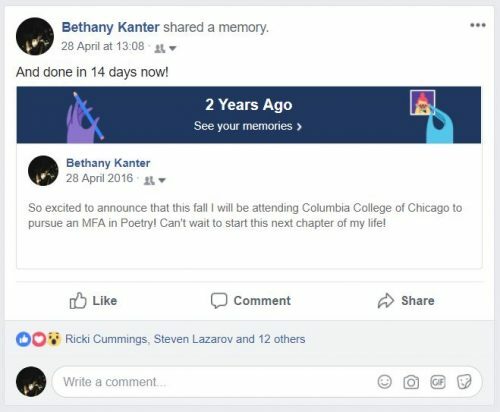 I'm a second year MFA Poetry Candidate from Hebron, WI. I'm interested in the body as other and language as material.